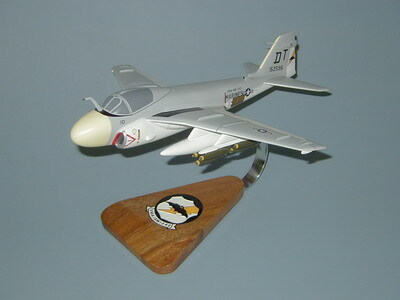 The first Intruders, the A-6A, first saw combat in March l965 in Vietnam, operating from the USS Independence. From that point on, Intruders of various models became heavily involved in the fighting in Southeast Asia. On February 27, l970, Grumman flew the first example of the A6-E, an advanced, upgraded version of the A-6A aircraft. The A6-E had two 9,300-lb thrust Pratt & Whitney J52-P-8B turbojets, giving the airplane a maximum speed of 644 mph, service ceiling of 42,400 ft, and a range of 1,011 miles; and an armament capability of 18,000 pounds. When the last A-6 variant left the production line at the end of l990, more than 660 of these expensive but versatile combat aircraft had been built and delivered to the US Navy and Marine Corps, of which some 360 were A-6E's, (120 new and 240 converted from A-6A's). Mahogany Wood. Scale: 1/48. Wingspan 13 1/4 inches, Length 13 1/2 inches.